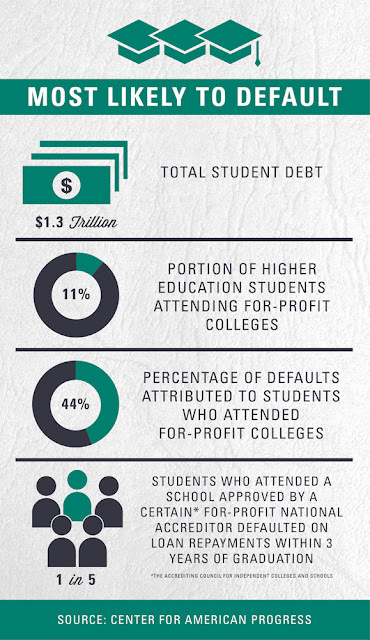 A recent study from the Center for American Progress (CAP) reveals that those who attend for-profit schools, such as trade schools and technical institutes, are more likely to default on their federal student loans. The study, Up to the Job? National Accreditation and College Outcomes, states that much of the blame for this trend can be placed on the low standards of for-profit accreditation organizations. One such agency, the Accrediting Council for Independent Colleges and Schools (ACICS), has been in the news lately because of its continuous accreditation of Corinthian Colleges Inc. (COCO). “Corinthian was built on a business model of recruiting low-income and minority students to attend expensive programs of questionable quality that were largely paid for with student loans,” said CAP. The federal government has been bringing lawsuits and launching investigations on Corinthian for years. Despite this, the ACICS maintained its accreditation of Corinthian schools “even as the Obama administration cut off its access to federal student loans and grants for falsifying job placement and graduation rates,” reported The Washington Post. The IPO was forced to close last April. Now, the public will have to pay for the loans the thousands of Corinthian students incurred and will likely default on. Their degrees and certifications from Corinthian won’t help them find jobs. This is a disturbing revelation for the economic health of our country, especially as CAP says there are similar warning signs at other accredited for-profit institutions. You see, the federal government relies on a network of accreditation agencies to monitor the quality of higher education institutions. There are five national accreditors that are mostly responsible for for-profit schools and seven regional accreditors, which cover public and nonprofit private schools. The accreditors give the schools a thumbs up and the government releases funds in the form of federal student loans and grants. These funds are crucial to the operation of these institutions and cutting them off via lost accreditation often means the end of the school and disaster for all past and current students. Because of this, accreditors often take on the role of assisting institutions to fix their issues and are generous with their chance giving. Revoking accreditation is often the last alternative. But it’s this lax attitude that can cause problems. For instance, according to the CAP report, 20% of students from colleges accredited from the national agencies who started paying off their loans in 2011 defaulted by the end of 2013. Only 12% of students who attended schools overseen by the regional agencies defaulted in the same time period. This study is part of an ongoing national conversation about the cost of higher education and the federal student loan system in the United States. The #MillionStudentMarch group is organizing a national day of action on November 12, calling for a switch to a free higher education system. Similar systems are common in other first world countries, such as Australia, Brazil, and many countries in Europe.